I wanted to give some credit in this post to the humble fly trap. We had a terrible time with flies this season. It actually got to the point where we purchased some nets for over our hats so we could be outside and use both hands.. You know, carrying stuff, hammering, repairing.. etc. The nets were sold out in town, and we went back a week later and we got the last two in stock! Clearly it wasn't just us. I did some research about ways to combat the problem, and came across raving reviews of the Gordys Fly Trap from New Zealand. Hmm, does that mean the flies get just as bad over there? 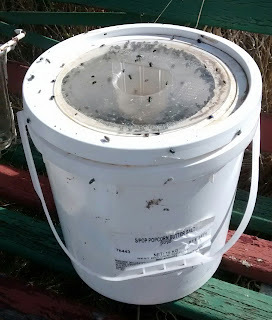 We have been using it all summer, and once we found the perfect location and the most disgusting smell, it's been collecting flies by the bucket load ever since. Infact, I've put a bigger bucket under it now. This bucket once held 15kg (33 pounds) of popcorn butter I think. Now it's more than half full of flies, and more are desperately trying to get in all the time. There has been a couple of dung beetles hanging around, but their flight is a lot more clumsy, and they haven't figured out how to get in, so thankfully they go find something else to bury. It's drastically reduced the number of flies landing on us, making it a lot more enjoyable outside again. The trap is far enough away that it doesn't smell in the garden. It's well worth experimenting with the location to get it just right. The Willy Wagtail's love it too, and can be seen hanging around it looking very fat. They raised 3 chicks recently! Ah yes, and we've used other fly traps here. We started with the little yellow lidded ones (which work ok, but on more a suburban-scale), moved up to Effecto, but it didn't work that much better than the little ones. I'm just so impressed with the Gordys that I thought I'd let others know that it's out there, and it really really really works! That fly trap looks like a doozy! I've only ever used the soft drink bottles cut in half with the top inverted and baited with some water and a prawn head. They too work wonders and give our fly catchers a feeding boost and us a lot of entertainment with their antics.